Product of the week is our PIR Motion Sensor – Basic – Ideal for detecting motion in your project’s vicinity. 15% Off until Friday at Midnight – so don’t miss out! Limit switches work great on anything from end stops on CNC machines to impact detectors on small roaming robots. They work like any other momentary switch and provide both the normally open and normally closed contacts. This specific version can handle 2A at 125VAC. The switch has two mounting holes – making this very easy to fit to machinery, robots, or other projects! The DC barrel plug is a very common connector; these power connectors are found on just about everything! This version is a bit different – it has a much longer barrel and is ideal for situations where the mating connector is mounted in a thick panel. 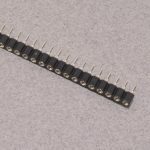 The 5.5 x 2.1mm plug has a barrel length of 14mm and is compatible with all 5.5 x 2.1mm jacks and connectors. This large 60 x 60mm Red LED Matrix is an excellent way to display data or create cool light patterns. Matrices like these are 'multiplexed' – so to control 64 LEDs you typically would only need 16 pins on your microcontroller or even less with a driver chip. Blynk is a powerful Internet of Things (IoT) app for iOS and Android that allows you to control your Arduino, Raspberry Pi, or ESP8266 from your mobile phone. In this tutorial we are going to look at the basics of setting up Blynk for the Raspberry Pi. Unlike the Arduino platform, setting it up on the Raspberry Pi is a little more involved so we have made this handy tutorial to get you up and running in no time. Interested? Head on over to the tutorial!